Jose Ramirez, a 2012 Olympian and current World Boxing Conference Continental Americas Champion, spoke at a special event TODAY at the Nisei Farmers League in Fresno, where in the name of the City of Avenal—a community member agency of the San Joaquin Valley Water Infrastructure Authority (SJVWIA), Ramirez presented a $3,300 check to the SJVWIA. 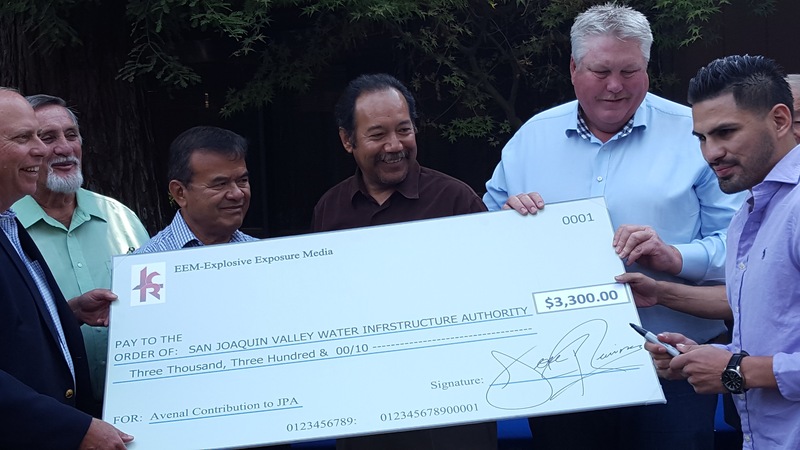 SJVWIA, in turn, is working with the U.S. Bureau of Reclamation and many Valley counties, cities and water agencies to coordinate and complete the Temperance Flat feasibility studies and prepare the necessary bond funding application. Ramirez, whose remarkable boxing record includes 17 fights and 17 wins—with 12 wins by knockout—grew up in Avenal, California (Kings County) with his parents working in the fields. “I knew those jobs were important to my family because they gave me a future; they gave my brothers and sisters their future; my friends, their families, their future; they brought food to the table,” he said. The “Fight For Water” boxing series, developed to help bring attention to the dire water issues in California, particularly in the Central Valley, has featured Ramirez in five victorious bouts to date. Despite an average year of precipitation, contracted federal water deliveries to many farmers in the Westlands Water District, for instance, have been cut by 95% thus far, this year alone, and the remaining 5% is now in jeopardy. Deliveries for the previous 10 consecutive years, were: 100% (2006), 50% (2007), 40% (2008), 10 (2009), 45% (2010), 80% (2011), 40% (2012), 20% (2013), 0% (2014), 0%(2015). "We got in contact with Mario Santoyo and Manuel Cunha, from the Latino Water Coalition, and it has been an honor working with them. The experiences—I have really matured myself as a person,” Ramirez said. “Besides a fighter, I have learned so much. I have become more passionate about this issue. I want to continue fighting for the water. I want to continue fighting for what's right for the people, for what's right for my family, for what's right for my friends' families and for other families where I grew up,” he said. "I am happy to work with the City of Avenal. I want [Avenal] to stay involved as much as they can. I want them to be a part of the programs, because I know Avenal is a good community," he said. "They've done great with all the kids there." “It’s because of Avenal, I am who I am,” Ramirez said. "The opportunities that they've given me I will never forget. This is why I'm here, to make sure that they stay involved, to help them, to raise what needs to be raised and for them to be part of the team that we're making, because I know that team is created by leaders, and I know that Avenal will do a good job being a part of it,” he said. “I'm happy to say I will do as much as I can to make that happen. We're going to continue fighting for the water, because I know that this is our future,” Ramirez said. “Being a father, I have to think about the future of my kids. And I have lots of friends who are fathers too, so I've got to make sure that they're set, or at least have hope,” he concluded. The Nisei Farmers League informs grower members about regulations and policies through meetings, seminars, newsletters and special bulletins. ; provides legal assistance for labor and workplace related issues; maintains a close working relationship with local, state and federal agencies and legislators to protect grower interests; and collaborates with other grower and agricultural organizations in California and other states to help provide a powerful, unified voice for the agricultural community.